Ashano Johnson is originally from Brooklyn, NY and completed his ungraduate work at the University of Colorado in Denver. 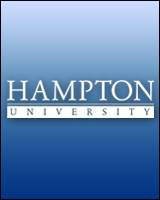 Ashano comes to Hampton University in the Spring of 2017, after sending 4 1/2 years in Charlotte, NC at Johnson C. Smith University. He is very passionate about student engagement and development and hopes to be impactment in those areas with his new family at Hampton U.